This study examined the direction and etiology underlying the relationships between parental negativity and early childhood antisocial behavior using a bidirectional effects model in a longitudinal genetically informative design. We analyzed parent reports of parental negativity and early childhood antisocial behavior in 6,230 pairs of twins at 4 and 7 years of age. Results from a cross-lagged twin model contribute to the understanding of the mechanisms underlying the bidirectional processes involved in parental negativity and childhood antisocial behavior. 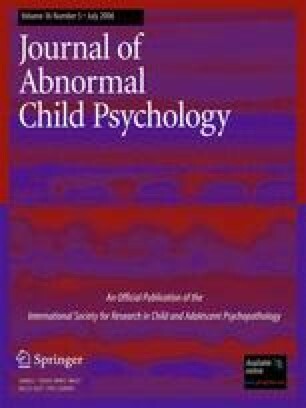 Specifically, the findings of this study suggest that the association between parenting and child antisocial behavior is best explained by both parent-driven and child-driven effects. We found support for the notion that parent’s negative feelings towards their children environmentally mediate the risk for child antisocial behavior. We also found evidence of genetically mediated child effects; in which genetically influenced antisocial behavior evoke parental negativity towards the child. Work on this article started while Henrik Larsson was a postdoctoral fellow at the Social Genetic and Developmental Psychiatry Centre, King’s College London. H.L. was supported by a postdoctoral stipend from Swedish Council for Working Life and Social Research (project 2005-1356). The authors are indebted to the twins, their parents and teachers. TEDS receives support from the UK Medical Research Council (G0500079). Research into development of antisocial behavior also receives support from the UK Department of Health and Home Office (MRD 12-37). We appreciate helpful comments of Jenae M. Neiderhiser on earlier versions of this article.